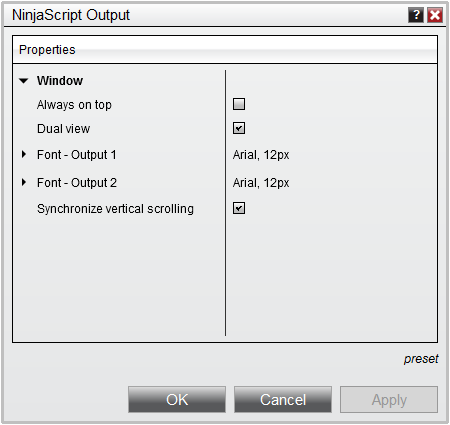 The NinjaScript Output is a powerful debugging tool which can be used to further analyze valuable information generated by your NinjaScript files. 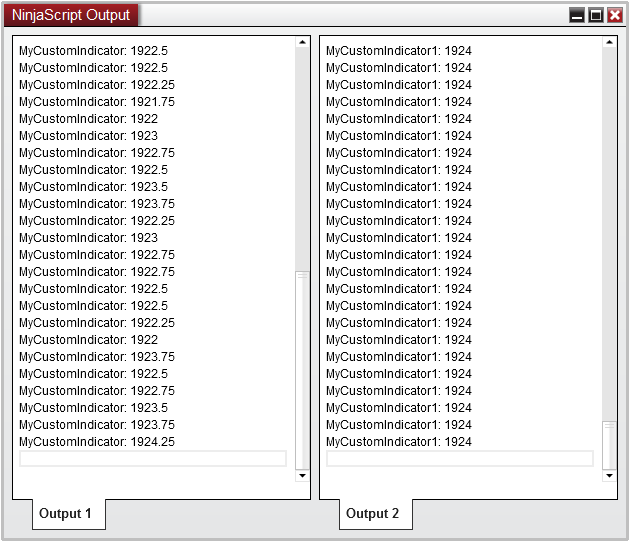 The Output window will only display data when other debugging methods such as the Print() or TraceOrders (for strategies) have been configured in a custom script. 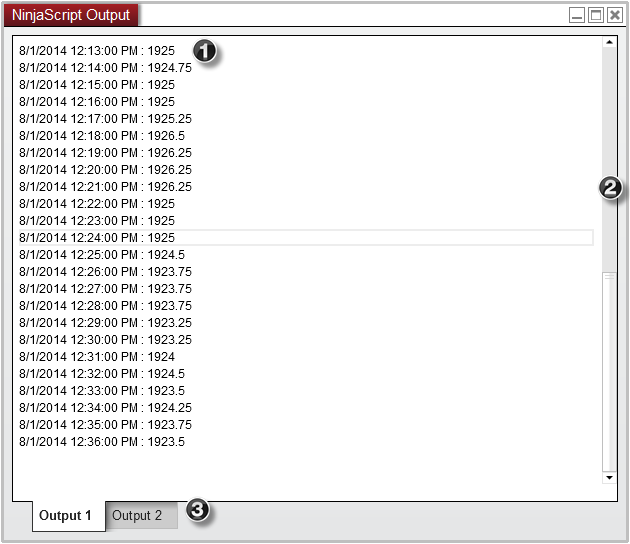 Two tabs available allowing you to separate the Print information for separate scripts. While the Output window is in Dual view mode, each output window will have an independent scroll bar which allows you to navigate each output tab separately. However if desired, you can synchronize the vertical scrolling between these two windows which will allow you to easily compare the output from two difference scripts where both tabs will scroll up/down equally at the same time. 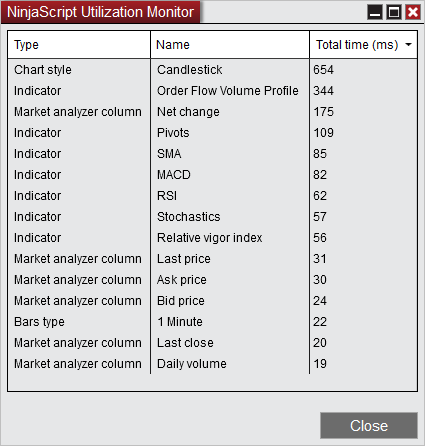 To enable this feature, right click on the Output window and select the Synchronized Vertical Scrolling menu item. 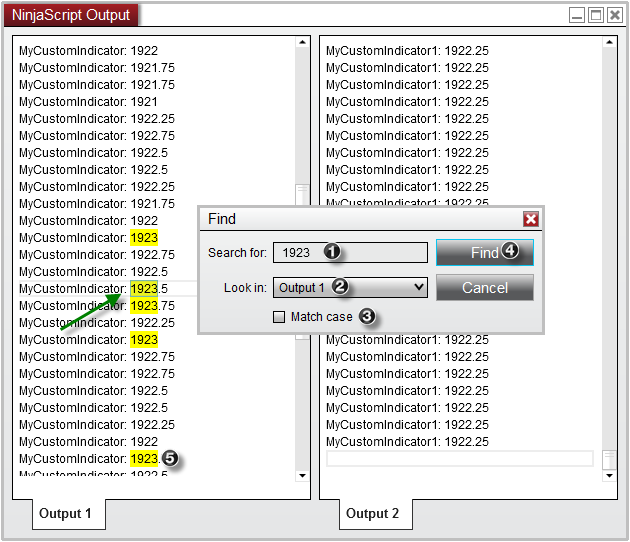 If you would like to search for a specific value or text displayed in your Output window, you can use the Find tool to both highlight and navigate any terms that match your search. To bring up the Find menu, right click on the Output window and select Find (or use CTRL + F as a keyboard shortcut). Selecting the Find button again will continue to search through the Output window and will highlight the next match. Tip: Without the Find tool, you can also highlight terms simply by double clicking on the text in the output window. Doing so will automatically search the highlighted term and highlight all results. After some time, you may feel the need to erase all the current information in the current output tab. To do so, simply right click on the current output tab and select "Clear". If you would like to save the current results of your output, you can right mouse click on the desired output tab and select "Save As". Doing so will provide you with a Save As dialog window which will allow you to save your output in a Text (.txt) file at any location on your computer. The NinjaScript Utilization monitor is opened via a right click in the NinjaScript Output window and will be mainly used as a diagnostic tool for performance issues. When using it as debugging aid, it's recommended to focus on the top resource using NinjaScript's, while absolute total time is negligible. b) it could be doing intense / steady calculations by design and a higher than average resource use therefore could likely not be avoided. It should be thought of a gauge to see where likely performance / code optimization time is likely most wisely spend if the overall performance footprint is to be reduced. Our support team is trained with this process and is available to assist.